The Kolibri Domino is offered exclusively on our seller page through Amazon. View the latest information and sales page here: Kolibri Domino. The Domino serial number is a string of numbers and letters unique to your unit that helps us identify your product and look up information regarding this specific product. 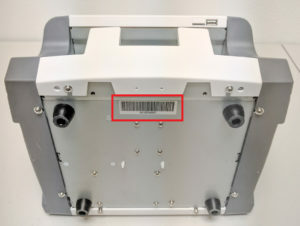 Please look to the underside of your unit for the serial number. Refer to the photos below showing the location of the Kolibri Domino sensors. 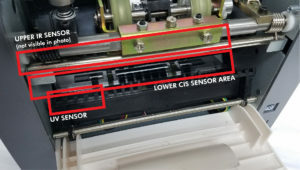 Figure (4): Lower CIS Sensor and UV Sensor, located near front rollers and back plastic roller guides, respectively. 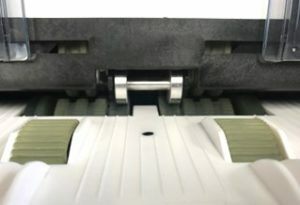 If bills are fed incorrectly into the Domino, they may enter the bill path in a stack, or at bad angled with may catch on internal components. If a bill enters the path crookedly, the unit is prone to jamming by bad feeding and may damage the unit and the notes as they pass through. Please refer to the below diagram for proper loading. 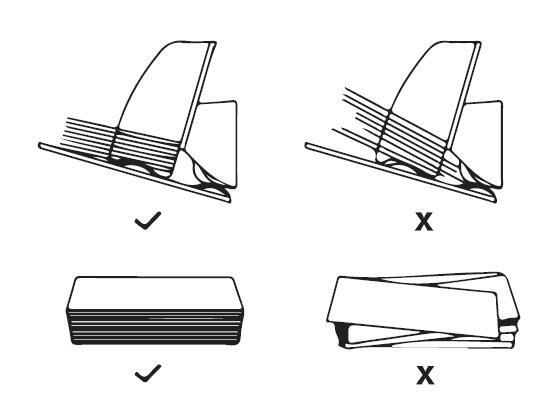 If bills are very worn, torn, ‘soft’, or in folded, the bills may crumple in the bill path and get stuck. 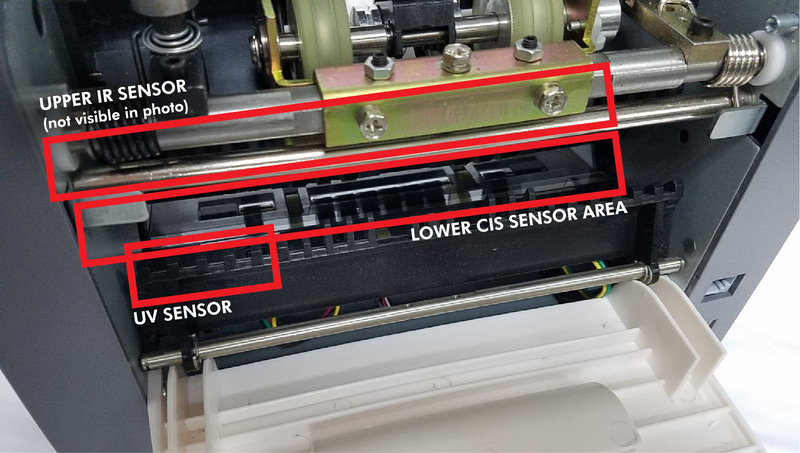 If jamming occurs frequently, there may be an issue with the feed gap adjustment. If the gap is too wide, the Domino will be able to accept more than one note at a time into the bill path which will frequently cause jamming. To learn how to adjust the feed gap, please refer to Section 6: What is a feed gap? How do I adjust it? Position the rollers so that none of the light-colored rubber teeth are visible. This can be done by turning the kick rollers. 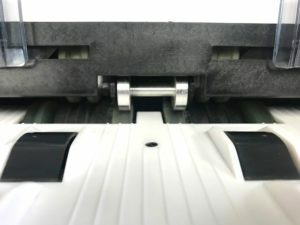 Only the black smooth sections of the rollers should be showing. Guide the bill between the inner rollers during this step; you should feel moderate resistance as you move the bill back and forth through these rollers. In other words, the gap between these rollers is wide enough to pass just one bill per count, but narrow enough to feel a slight tension or friction when pulling the bill out. Make an 1/16’’ adjustment turn at a time, then retest. 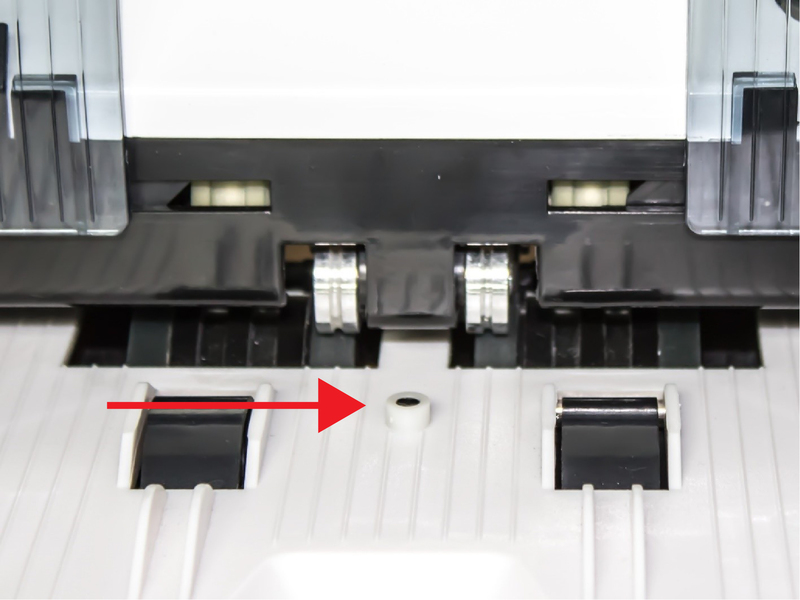 Important Note: The Kolibri Domino’s feed gap adjustment can be sensitive during adjustments. 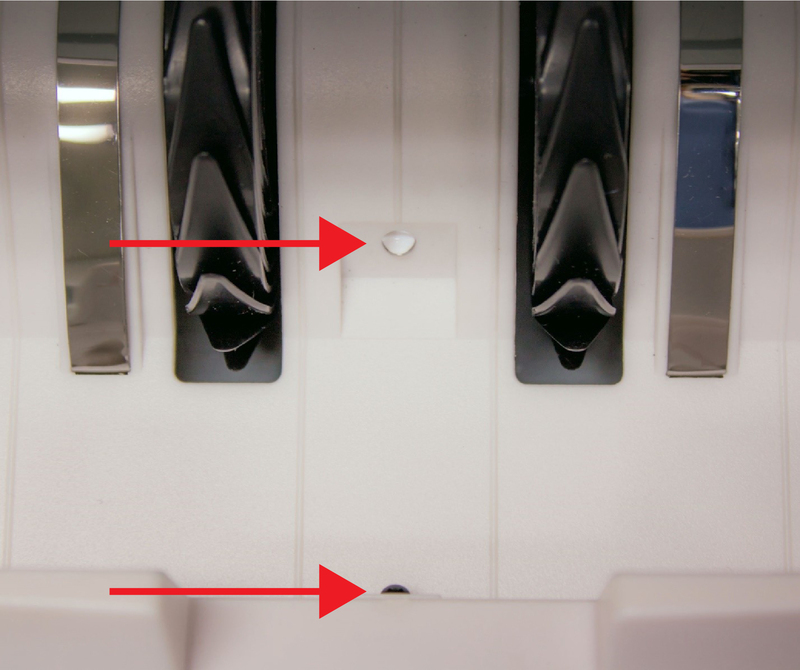 Do not overturn each adjustment or you may overshoot the optimum gap. We recommend testing with a stack of bills after each adjustment turn. CHECK PS1 Check if the upper door is open or a bill exists in the bill path. CHECK PS2 Check if the lower door is open or a bill exists in the bill path. 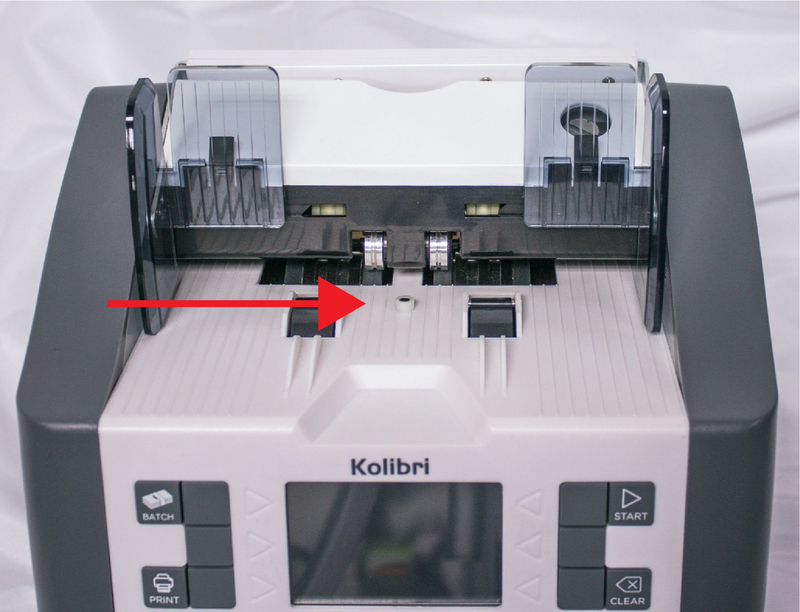 The Kolibri Domino is designed to detect and flag any suspected counterfeit notes. This unit provides UV, MG, and IR anti-counterfeit feature detection. To learn more about detection techniques, please refer to Section 9: What do MG, UV, and IR stand for? What’s the difference? UV – Ultraviolet Feature Detection – Certain features are hidden to the naked eye on all US currency. 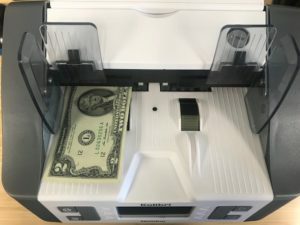 In order to detect these features, the Domino has special ultraviolet emitters and sensors capable of detecting the exact ultraviolet anti-counterfeit features built into each denomination note. These are referenced against known-genuine currency and used to flag any notes that do not display the correct UV features on the suspect notes. 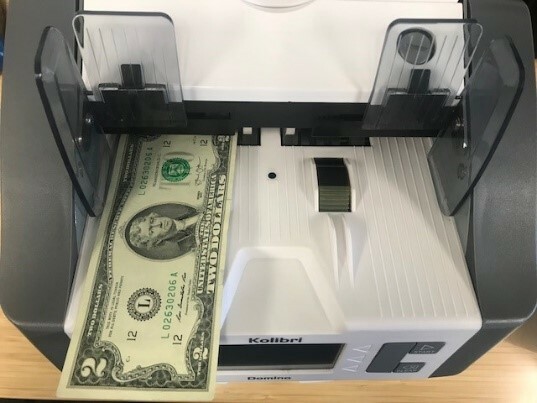 IR – Infrared Feature Detection – Similar to UV, US currency contains hidden infrared features that can only be detected by infrared illumination and detection. The Domino scans each bill for the presence and accuracy of these features and fails any bills not meeting these criteria as ‘SUSPECT’. There are a few reasons that a detector may flag genuine currency as suspect. If bills are worn, bent, torn, or crumpled, the anti-counterfeit features needed to verify a bill as genuine may be compromised. 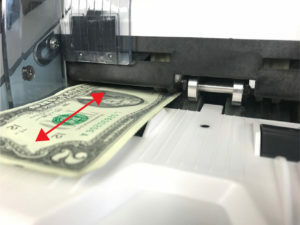 For example, the magnetic ink on a note may wear over time or heavy use, reducing the magnetic response to below detection thresholds. If the Domino cannot verify the correct features expected on a note, the unit will flag that currency as ‘SUSPECT’. If sensors are dirty or damaged, the Domino will not be able to detect the necessary anti-counterfeit features needed to verify currency as genuine. One of the most common reasons for miscounting is improper loading of the currency to be counted. In most cases the Domino will display an error and prompt the user to reload the currency. 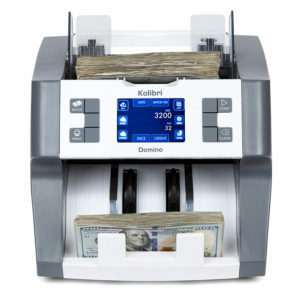 Yes, the Kolibri Domino uses advanced sensing to determine the denomination of the notes being scanned and automatically counts the correct total of the currency being counted, or sort out notes as the user specifies. 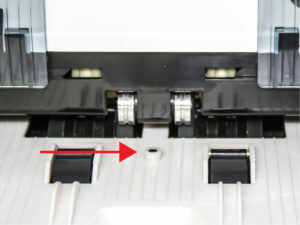 The Domino uses a F1A250V 200mm Length by 5mm Diameter fuse above the AC power inlet (where the power cord inserts to the back of the unit.) 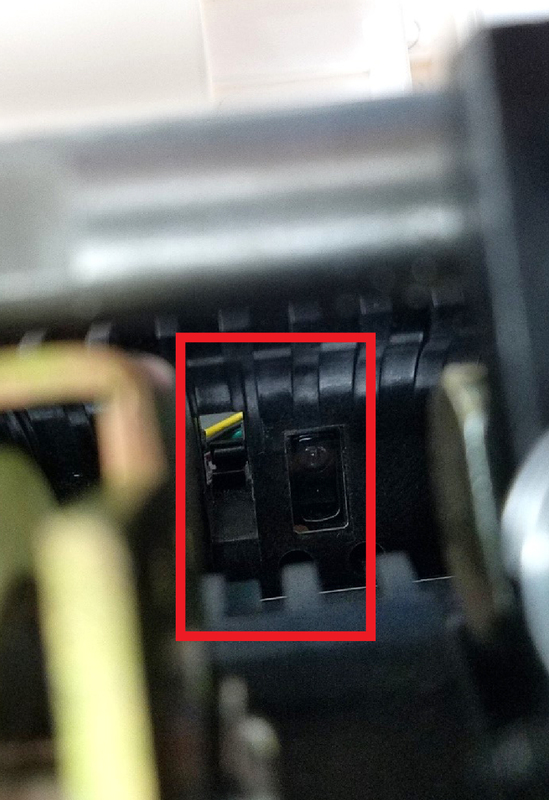 Check this fuse if the unit does not power on. 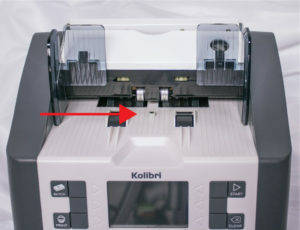 If replacing the fuse does not solve power-on issues, please contact Kolibri Customer Service.